What do bloggers talk about when they meet? When Maiji (my mother) first started blogging, one of the persons who appreciated her writing was fellow blogger Abraham Tharakan. 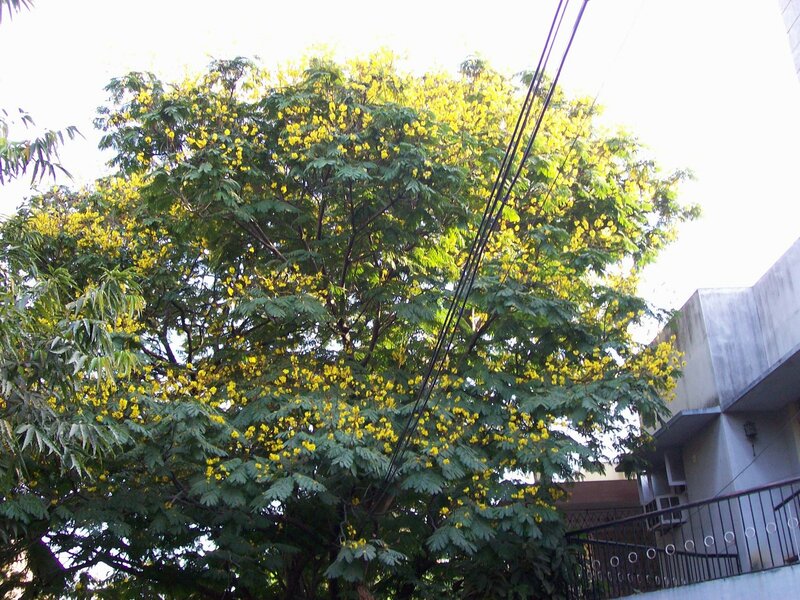 Maiji continued blogging, and it seemed serendipitous that Abraham also lived in Chennai. Emails went to and fro and it was decided that we should meet one another at some point. And the fact that all our blogs were featured in the group blog Mysore Park Blog, only made the prospect more appealing. On Easter Sunday, Abraham visited us and we spent a nice one hour talking to one another. The surprising thing was, none of us felt we were talking to strangers whom we were meeting for the first time. Over some coffee (which Abraham remembered from a previous blog!) news and views were exchanged. 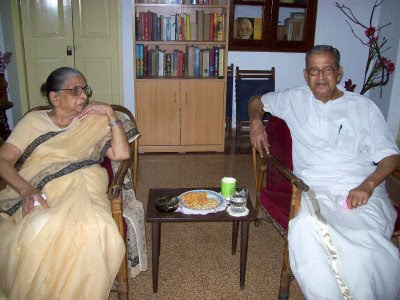 When Maiji turned 80 in 2007, I had posted an article mentioning it as the day of one thousand moons. Abraham had pointed out that by one’s 80th birthday one could not have seen a thousand moons – and he is right, of course. I found this a good opportunity to tell him so, belatedly. Blogs are a great point of communication, and obviously they tell the reader a lot about the writer. And the comments section helps us to interact. 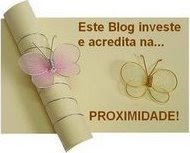 Blogging is a great way to make friends, as we have found out. A close circle that is ever widening. 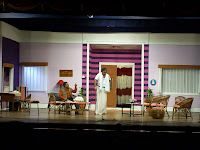 It was the talk of the town – a new play by K. Balachandar, after a gap of more than 40 years. And I was quite excited at the prospect of attending it. After all, I have been a faithful follower of his movies from the late 1960s. In the intervening gap of those 40 years, Balachandar had given up his job in the Accountant General’s office and graduated from being a part time dramatist, penning his delightful plays, to cinema direction, and later when television appeared to making serials. Balachandar’s earliest pictures were productions of his plays like ‘Server Sundaram’ (though this was directed by Krishnan Panju), ‘Navagraham’ and ‘Major Chandrakant’. In the 60s and 70s, we used to look forward to every K. Balachandar (KB) movie – and were never let down. All that we expected from him would be there - a good story, excellent characterisation, suspense and liberal doses of humour. With Nagesh in the cast, there was no dearth of that. They made a sound team, Nagesh and Balachandar. 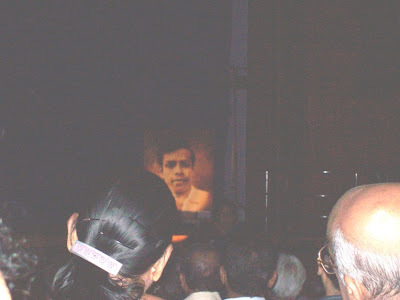 And so at the first show of the play ‘Pournami’, (a first for us, too!) which KB had penned and directed after 40 years, it was most touching to see, after the lights dimmed, a picture of Nagesh highlighted before the curtain went up, and the signature dialogue “Maadhu Vandhirukken” from ‘Edhirneechal’. It was followed by KB’s voice in the background chiding Nagesh for going away, leaving him behind. A poignant moment, and it seemed fitting when KB dedicated the play to him. KB also mentioned the partners of Kalakendra, who had produced all his earlier pictures. It was good to hear him talk about his early days, and his decision to come back to his first love the stage. “I am reborn again.”, he said. ‘Pournami’ is a topical story. It narrates the upheaval created in a family when a member is arrested by Pakistan authorities as a spy, when he goes there on work, and is held in exchange for the release of a terrorist. Naturally, there is a lot of scope for political pontifications – which I found boring - and some punch lines which raised some laughs. Pournami is the wife of the abducted Navneet, (who a la the Irumal thatha of ‘Ethirneechal’, never appears on stage). How, with the help of a relative who is a retired major in the army and is called - guess what? 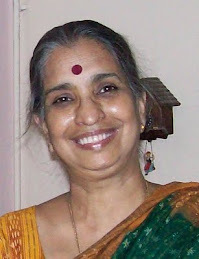 Major Chandrakant - she works to bring about his release forms the story. Shades of the movie 'Roja' here. The performances were good - they would be, with KB at the helm. When his old production office had borrowed our ground floor premises for the shooting of one of his movies in the early 70s, we were able to see how he extracted perfect performances from his actors (including Rajnikant, then a newcomer). Renuka as Pournami was good and looked pretty, but somehow she was not able to cast off the mantle of Renuka totally. Fathima Babu of news reading fame, on the other hand, gave a terrific laughter-generating performance as the ‘almost got Padmasri’ lady, who is a bit of a nosy parker too. As her to-be-daughter-in-law, Kavya sends her parents (and some of us, too) up the wall with her ear constantly glued to the cell phone, when her fingers are not texting/smsing. This is a nice dig at today’s youngsters and their dependence on the mobile phone for survival. Kavya’s constant prostrating in front of Fathima to get into her good books also raised a few laughs. The characters and situations create the humour, and the strong story keeps the play from being a mere hook on which to suspend jokes. The actor playing Navneet’s brother*, and Poovilangu Mohan as Chandrakant also impressed, though the latter’s ‘Maon hoon na’ got on my nerves after a while. The story moved on a single set, very pleasing to the eye, and the lighting effects were well handled, especially in the scene where Navneet is allowed to speak to his wife from jail. I wondered why Renuka did not change her costume more often, while the others did, to show the movement of time. 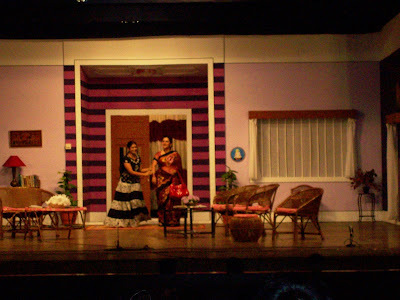 The play was staged under the aegis of Kartik Fine Arts, one of the leading Sabhas in Chennai, at Narada Gana Sabha Hall. And the 1500 capacity hall was full. I looked around and found no one under 30! The sabha regulars were the usual middle-aged and retired group, and ticket holders seemed to belong to that group, too. Not surprising, since KB is himself over 70, and his fans, would be in the same age group. I went with a lot of expectations, and enjoyed myself. But I learnt something too - you can never turn the clock back. *I have since learnt that the actor Karthik is part of Evam, a group that has made a name for itself in producing and staging plays in English in the city. P. S. The photos did not turn out very well, and I am disappointed a bit. Can you guess what flower this is? I used to call it the powder puff flower, for that is what it looks like, soft and pink, and spreading out its fine filament like petals. 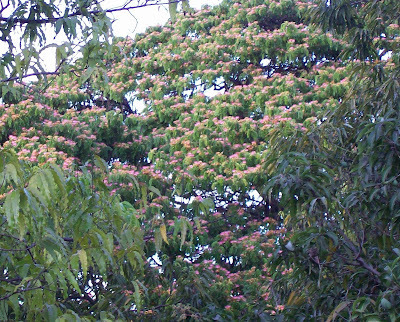 This is the flower of the rain tree. 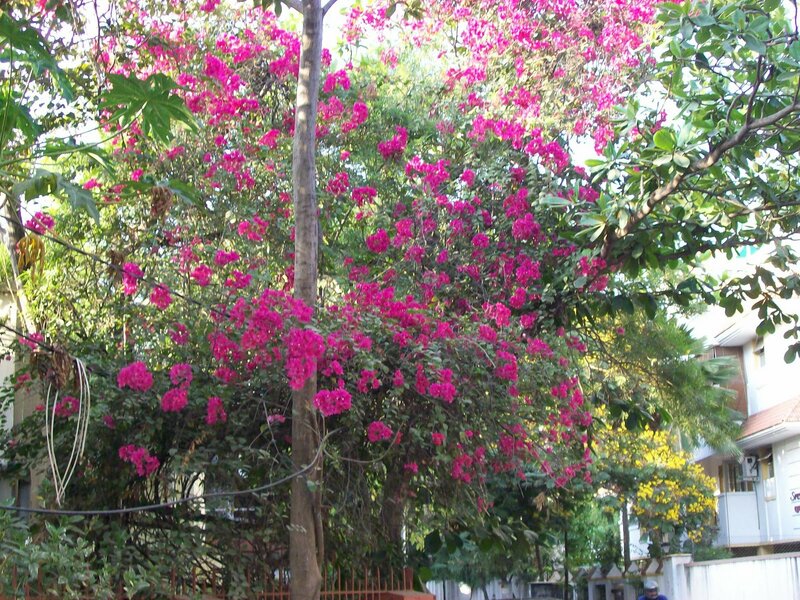 Millions of these small pink and white flowers lighten up the sprawling branches of the tree. 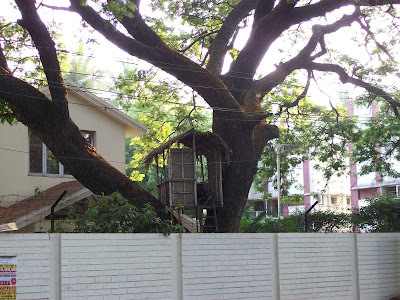 This large tree (large enough to accommodate a tree house! See picture below) is right across the road from our home, and no sooner does summer set in, than it begins to throw forward these little beauties. Soon the road is covered with fine petal dust from the fallen blossoms of the previous day. This is a view of the tree from our terrace - sadly, the tree is blocked by trees in our garden, and a better view is not possible. I always imagined it to be a tropical tree, and I was pleasantly surprised to see one in Seattle, flowering in June! Do click on the pictures for an enlarged view. “From tomorrow, you have to sit on the floor and eat your meals in the traditional manner,” I told my husband. He looked at me, alarmed. He thought I had lost it. I comfort myself saying I have reached the stage where I need not bother so much about appearance. I don’t even care about dying my hair, but you could put that down to laziness. And anyway wearing a sari is very advantageous - it hides some unnecessary what I may optimistically call curves, but what are really bulges. And no alterations are required if you are going to lose weight or gain weight. You can continue draping the whole six yards, no matter what size you are. I firmly feel that after all these years I can indulge myself by managing my chores with minimum physical effort. I prefer not to walk because I have some arthritic problems – I have had them since I was 35. I only have to mention this, and everyone is sympathetic. And almost everyone else has similar problems - back aches, painful knees, shoulder pains, and creaking joints by the time one is forty. I wondered why. I began thinking about how our life styles have changed. In the late sixties when I got married and set up home, it was still common for everyone to eat sitting on small wooden planks, or on small mats with the plates in front of you on the floor. Apart from the exercise obtained by serving food, (ah, how firm were our calves then, how slender our waists!) one just could not eat beyond a certain amount sitting in that position. We cook standing, with our stoves on counters, and all preparatory work like chopping vegetables, cleaning rice, kneading dough, rolling out pooris is done on counters. And all washing up in the sink, which is at a convenient height. I am really happy that we women don’t need to slave over hot firewood stoves, or grind the spices for the curries manually, or grind the dough for our staple idlis and dosas using the old grinding stones, like my aunt in this picture. Women sat on the floor to clean the rice, and even pack their suitcases. The pictures show my aunts and cousin arranging their clothes in boxes before a journey, and yet another aunt removing the stones and husks from the rice. I am glad that we have washing machines to take the pain out of laundry, and mixies and grinders to ease our lives. (Having experienced all the manual labour, I can tell you what a relief it was that these appliances were invented.) And we don’t have to walk everywhere – apart from taking a lot of our precious time, it also tires us out. So, in effect, there is less exercise all around – and I have lost the ability to use my body and keep it supple, if not in shape. Atrophy through disuse – is that what has happened to me, I wonder glumly. Not even to hang the laundry on the line do I stretch my arms and torso – the domestic helper does it for me. My only consoling thought is that the arthritis reached me before the mod.cons. and appliances did.. Sigh! Since my husband is not willing to oblige, I have to pull out the walking shoes from the cupboard (still brand new and as pristine as on the day my son got them for me 9 years ago) and start taking post prandial walks, or pre-breakfast strolls or, worse still, exercise. All the above pictures were taken by my uncle Moorthy in the 1950s. I never expected my calendar to be highlighted by festivals like Sivarathri and Rama Navami! Festivals I did not do much about, for they did not require much activity in the kitchen – unlike Sri Krishna Jayanthi and Vinayaka Chathurthi. Both these festivals meant a lot of work preparing the special offerings (‘neivedhyam’) to Krishna or Vinayakar. But how much work is really required to make ‘paanagam’ ( jaggery dissolved in water, and flavoured with crushed cardamom and dried ginger powder), ‘neer moru’ (salted buttermilk with curry leaves and crushed asafoetida) to offer Sri Rama! Or observe a fast for Siva! This year however these two events marked a special – our group Gangamritham singing at temples. Last week on Rama Navami, April 3, we sang at the Raja Annamalaipuram Karpaga Vinayaka Temple. The temple is well maintained and an aura of sanctity pervades it. There are other deities here apart from Sri Siddhi Buddhi Samedha Sri Karpaga Vinayakar. We were able to witness the abhishekam and evening pooja at all the sannidhis before starting to sing. Our guru Ganga had taught us a good collection of songs on Rama. She had also painstakingly taught us verses from Tulsidas’s Sri Rama Charita Manas, set to music by her guru, which encapsulated the Ramayana, in different raagams and thaalams. This was to be the highlight. For the first time, we had a proper stage (albeit small) to sit on and sing. We were introduced individually! (See picture) And we had a bigger audience than usual, all seated comfortably on chairs (this included my mother, my sister-in-law and my recalcitrant husband, who shocked my friends by putting in an appearance). The audience was appreciative, applauding at the end of each song. Our accompanists for the day were Harini on the violin and Umayalpuram Kalyanasundaram on the mridangam. We missed Vidya and Padmini - two of our group who could not make it. Since a couple of my regular reader friends had requested me for a recording, here is a very brief one. I requested a friend to take the video on the camera. The picture is not good, you tell me how it sounds. 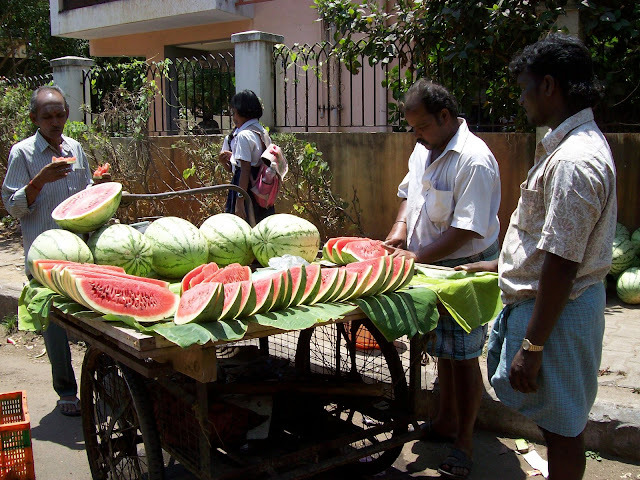 It is beginning to get very hot here in Madras/Chennai - to those living in cooler climes, it would already seem very hot, but the dog days are yet to come, after the Thamizh New Year sets in. Nature has its own way of making up for the discomforts of seasons. 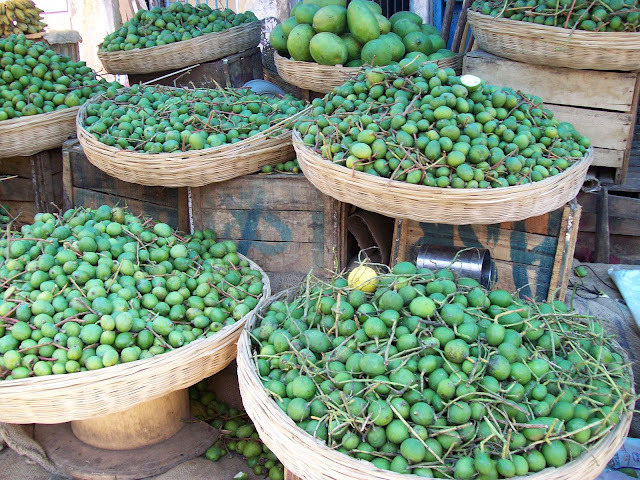 Street shops, sprout up with the seasonal treats that cool us off. The gorgeous , succulent watermelons, are a treat to the eye as well. 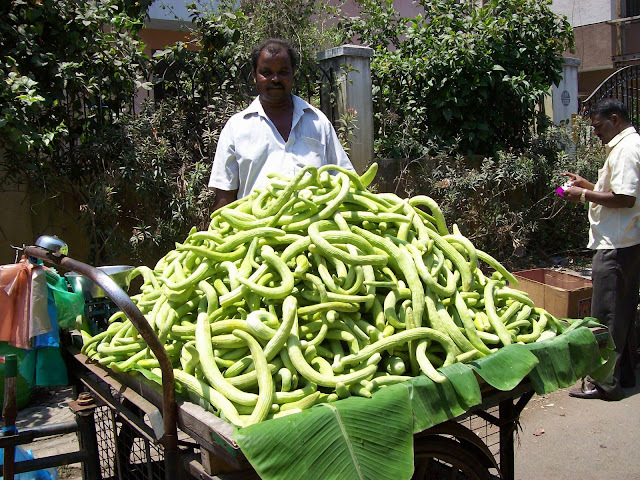 This variety of cucumber, tastes marvellous with the salt and pepper (which the vendor readily provides you with - at least, he used to, I did not check it this time). Water stored and cooled in porous mud pots tastes sweeter than water from the fridge. These were selling like hot cakes, pardon the expression. 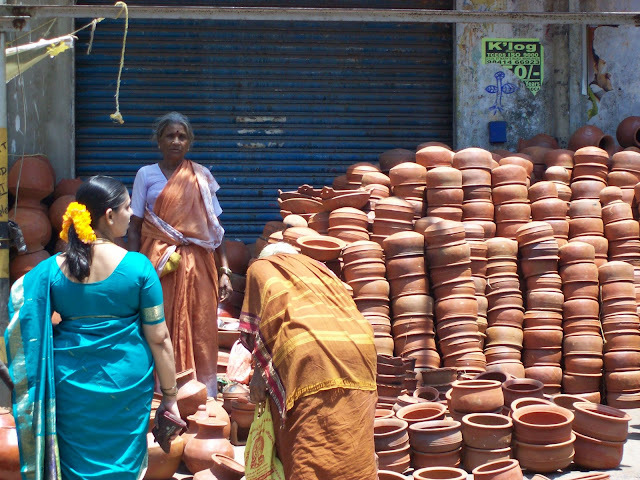 The flatter versions seen here are used for cooking and storing food. And these lovely colours, golden yellow acacia and the magenta bougainvilla. The pictures look better when enlarged - please click on them.